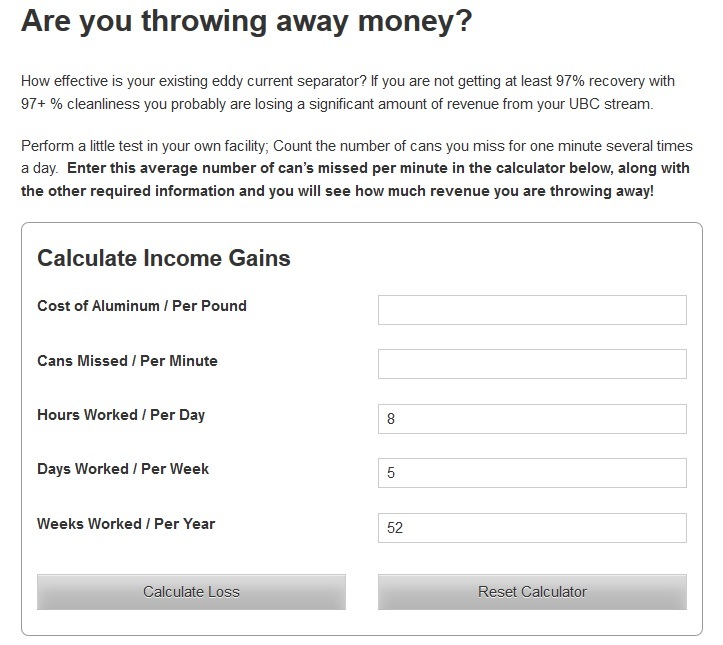 For Immediate Release: Posted On 2/7/2018 By Industrial Magnetics, Inc.
Industrial Magnetics, Inc. recently published a new tool on their website to help plant managers calculate potential revenue loss from their existing Used Beverage Can(UBC) recovery lines. Reclaiming aluminum cans typically involves the use of an Eddy Current magnetic separator, which repels the can as it passes through the magnetic field. In this way, the aluminum is “thrown” and separated from the rest of the waste stream for recycling. As Eddy Current Separators can vary in their magnetic field strength, overall design, and years in use, the tool aims to help users identify what the inefficiencies of their current equipment may be costing them. Taking into account factors such as number of cans missed in 60 seconds, the current price of aluminum and the number of hours the line runs, managers can better assess their current productivity and evaluate the pay-off on the investment in new equipment. A video of IMI’s line of Javelin Eddy Current Separators is also available on their website, demonstrating how aluminum beverage cans are thrown from the product stream for collection. For more information, please visit the Javelin Eddy Current Separator page on our website, or contact us at 800.662.4638.